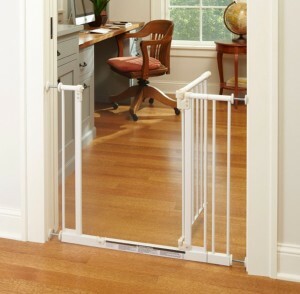 Walk through baby gates are ideal for high traffic areas since they allow for super easy movement instead of hopping over or removing them completely. Some of the designs are hands free operated. A better option for any parent to consider is a door that swings in both directions or one that closes automatically since it is much easier to use when your hands are full. These gates are either hardware or pressure mounted. They are used as a protective barrier for long term or short term purposes since they allow you to have a swinging door for easy access just about anywhere. You can install them at doorways,between rooms or stairways. This gate is a rigid steel structure which has a door built in, rather than the whole gate swinging open. The door is a 16 inch wide portion opening only in one direction. It fits doorways from 29 inches wide to 40 inches wide and has a one 6 inch extension included if you need to fit wider doorways. It measures 31 inches in height. The door lock operates with only a simple slide and lift for easier locking and unlocking. The opening mechanism is simple and intuitive, using a one handed lever with a child lock as well. The gate is designed for children between 6 months and 24 months of age.Similar to other designs, this one can serve as a pet barrier as well. When not in use, the door can be left open for easy back and forth movement. It is pressure mounted, quickly installed, is strong and sturdy, and does not damage your frames. If you prefer to mount it at the top of the stairs or for permanent installation, the gate comes with included hardware to facilitate its mounting to the wall. This is a basic design that will do its job well – keeping your child out of the dangerous parts of the house and keeping them safe. Check the video below illustrating its features. If you are looking for an extra wide walk thru’ gates for large openings such as the porch or other wider openings be it an extra wide hallway, at the bottom of stairs or between rooms, the following will best suit those wider areas. These gates fits openings up to 72 inches wide but have varied height measurements. The pass thru door will allow you to easily move from one area to another. This extra tall metal gate measures 36 inches in height. It fits openings from 28 inches to 31.5 inches without using any extension and up to 48 inches wide with the 3 included extensions where each of the two extensions measures 4-1/2-inches wide and one extension measures 9 inches wide. The auto close door is a 17.5 inch wide portion that opens in either way and is easily operated using only one hand. After walking through, the door locks and closes automatically. 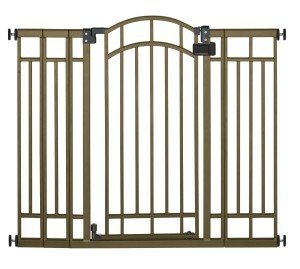 The gate is either pressure mounted allowing for easy installation or removal. Optional hardware is included if you prefer to have secure mounting. This attractive barrier has a bronze finish and sleek arched door. You can use it at the bottom or top of the stairway. The gate is designed for children between 6 months and 24 months of age. 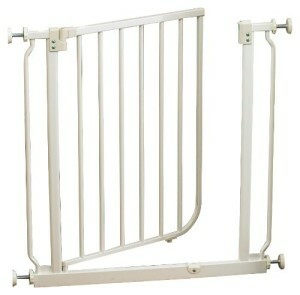 This easy close metal gate measures 29 inches in height. It fits openings from 28 inches to 31.5 inches without using any extension and up to 38.5 inches wide with 2 included extensions. The swinging door opens in either way and has a triple locking system that is easily operated using only one hand. When not needed, the door has a stay open feature and swings closed automatically. It is pressure mounted using the included tension knobs to secure the gate. It is JPMA Certified.